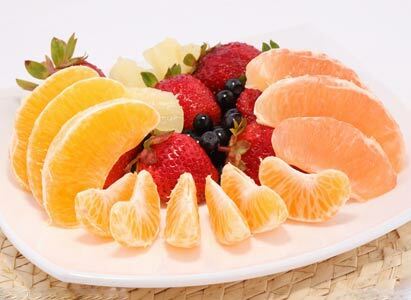 Experts from Modern Cancer Hospital Guangzhou pointed out five sets of fruit per day can reduce 20% risk of cancers. These suggested fruits include strawberry, orange, tangerines, lemon, grape, apple, kiwi fruit and grapefruit, etc. some of which contain the Irreplaceable special elements that can prevent cancers like leukemia, lung cancer and stomach cancer. Among all anti-cancer fruits, strawberry has the best anti-cancer effect. Fresh strawberry contains a substance named tannic acid, which has anti-toxin effect to human body and can prevent the formation of cancer cells. Moreover, strawberry contains a carboxylic acid, which has good effect in preventing blood diseases like leukemia and aplastic anemia. However, patients of urinary lithiasis and poor kidney function should cut down the intake of strawberry, for too much of the calcium oxalate in the strawberry can worsen the patient’s condition. Fruits like orange, tangerine, lemon and grapefruit contain rich bioflavonoid, which can enhance the activity of some enzyme in the human organs like skin, lung, stomach, intestine and liver, and can change the cancerous substance from fat-soluble into water-soluble. Therefore, it can prevent the cancerous substance from being absorbed by the body and allow them to be excreted out of the body. Moreover, abundant intake of cedrate fruits can supplement vitamin C, which is an important anti-cancer element. It can improve the immunity and prevent the formation of carcinogenic nitrosamine, and therefore can prevent gastrointestinal cancer. Further more, cedrate fruits like orange and lemon can reduce 50% risk of cancers, including oral cancer, laryngeal cancer, intestinal and stomach cancer, as well as 19% risk of stroke. They are also effective in preventing angiocardiopathy, obesity and diabetes. Kiwi fruit contains rich vitamins, among which the content of vitamins C is 1-2 times higher than that in orange, 30 times higher than that in apple, and 60 times higher than that in grape. Latest study has proved that kiwi fruit contains an active substance, which can prevent the formation of carcinogenic nitrosamine. Therefore, it has very good effect in resisting cancer. Pear not only contains anti-cancer elements like carotene, vitamin B2, vitamin C, etc., but also can engender fluid, clear heat, moisten dryness and resolve phlegm. Therefore, it is helpful in cancer prevention, especially for nasopharyngeal cancer, laryngeal cancer and lung cancer. Grape, especially the grape skin, has rich anthocyanin and resveratrol, which are natural antioxidant. Moreover, they can prevent the precancerous cells from cancerating and destroy the replication capacity of leukemia cells. Apple contains a very useful element called polyphenol, which can inhibit the proliferation of cancer cells. Researchers have found that the polyphenol in apples can reduce the risk of colon cancer. Study showed that after given apple polyphenol solution, the survival rate and quality of rats, which had been implanted with cancer cells, are improved. Although many fruits are helpful in cancer prevention, patients should make the choice according to personal conditions. Experts from Modern Cancer Hospital Guangzhou kindly reminded that the most suitable time to eat fruit is one hour before dinner. For fruit is non-cooked food, it can avoid increase of white blood cells to eat non-cooked food before dinner. Thus, it is good for human immune system.